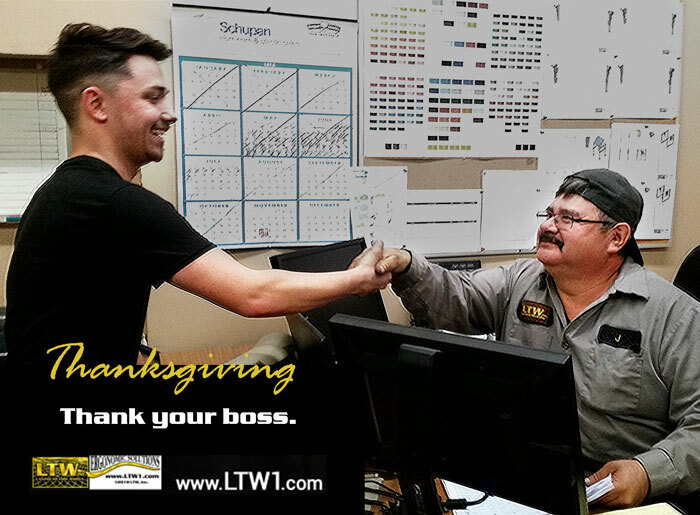 LTW’s Travis thanking Manufacturing Manager, Harvey. Talking about bosses can be tricky – depending on your relationship with them. Talking to bosses can be even trickier! Let’s take this Thanksgiving season to reflect on their importance and value to your company. How does your boss help you? Do they help you keep projects on track at work? Managing people can be a stressful job. Tons of people in the workplace choose not to take promotions to management positions because of this stress factor. Even if your overseers seem distant from your work, they likely still do help in unseen ways. Would you like to be someone’s boss? Your current overseers have the power to suggest you for open positions. Are you the kind of team player that would make a good coach? A wise man said it well: “He that is faithful in that which is least is faithful also in much: and he that is unjust in the least is unjust also in much.” Luke 16:10, KJV. Every day at work counts towards our careers – let’s make the most of them! What are your thoughts? Let us know by sharing on social media!